Yes, you are reading it right. The new market trend is all about being able to take a bite of your favorite food without ripping the wrapper off! And these don't fall short when it comes to the look either. 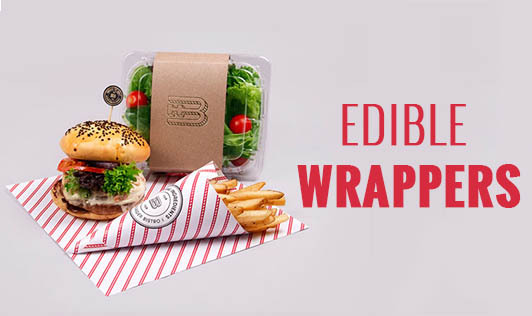 Edible wrappers have it all; flashy hues, product descriptions, food and nutrition information, and different shapes and prints. So how are these possible? Edible wrappers are usually made of a complex polysaccharide-like starch such that they react with the inner food particles and nutrients to form a gel-like protective film. The food is guarded against oxygen and water during the storage periods to conserve its shelf life. Currently, foods such as ice creams, yoghurts, chewing gums, burgers, chocolates, candies, fruits, and vegetable bites, are some of the products available in such edible packages. As this technology is only applicable to small food quantities, the portion size that can be consumed by an individual is also controlled. Apart from this, product sales have also increased as these are fun to try and provide unique tastes and combinations. This is why edible wrappers have become more like a marketing strategy for many foods. The added advantage these wrappers have is that they help conserve the environment largely by minimizing food wrapper disposal. But unfortunately, as most of these wrappers are designed with a combination of starches and sugars, they add on to the carbohydrate intake. If we begin consuming these wrappers each time we purchase a packed food product, our over all carbohydrate intakes will shoot up immensely and this may lead to increased incidence of lifestyle diseases and health issues.